Earlier in US history, it was common for universities to admit students via entrance exam. A quote in this answer quoting Colonial Education explains "The boys from upper class families were taught be private home tutors and then sent to college or university." Nowadays, a high school diploma or an officially recognized equivalency (such as passing the GED exam) is generally recognized as the standard way to qualify to start studying at a US institution of higher education. Although such a credential is not strictly an absolute requirement even today, the idea of "finish high school, go to college" seems to have been standard in the USA at least as far back as the 1950's (with enrollment of "non-completers" or "dropouts" as the exception to the rule rather than standard practice), as my parents reported to me that essentially the same formal expectations existed then. At what point did graduation from a "High School" or the achievement of an equivalency qualification specifically recognized as equivalent to high school become the standard way to get into a university, with other paths becoming the exception rather than the rule? Yes, I know that it is still possible for someone to be homeschooled, pass the GED at age 18, and then go straightaway to college, but the GED is specifically recognized as high school equivalent, not a truly distinct academic pathway. I'm talking about a time period when there was no concept of a high school equivalency, or when the achievement of a high school qualification was truly an optional part of the process of qualifying for university. That is, an aspiring university student might have chosen to complete a high school qualification because their parents wanted them to, because they wanted the "high school experience", because they were being funded to attend, because it was easy for them, etc. but they could have reasonably and without too much head-turning short-circuited the process and/or followed an older, still common alternative path to a university (e.g. private tutoring toward passing a direct entrance examination, getting sponsorship from a local politician, making a substantial bribe large grant offering, etc.) if they had wanted to. Alternately, when was the first time in US history where an incoming Freshman might hear something like, "Wow, you did the thing where you study at home with private tutors and then get five alumni to endorse your academic abilities? What a weirdo! Nobody does that anymore! If you want to be in the "cool" crowd, it's all about getting your high school diploma! I wouldn't be surprised if the university abolishes all those non-high school paths next year." Question: At what point did high school become a standard prerequisite for university students in the USA? The United States educational system unlike those in Europe is not centralized and thus the above question varies by state and sometimes varies by county. So while Massachusetts converted the private high school Boston Latin to become the first public High school in 1820, and 7 years later offered free education to children of all ages including free High school as early as 1827; most of the rest of the United States didn't follow suit for 100 years. Secondly the United States secondary school system was a terminal degree. It was not meant to be a preparatory program for higher Education. So while the United States experienced a High School movement from 1910 to 1940. When communities prioritized High school programs as a way to attract people and businesses; leading to mass opening of high schools. "In 1910 18% of 15- to 18-year-olds were enrolled in a high school; barely 9% of all American 18-year-olds graduated. By 1940, 73% of American youths were enrolled in high school and the median American youth had a high school diploma." But that doesn't entirely answer your question because most University students did not matriculate from this public high school system, but from private schools. University degrees remained primarily pursuits for the wealthy and public high school programs remained a terminal free degree for everybody else. What switched everything up was the "The Servicemen's Readjustment Act of 1944" or the GI Bill. This opened the doors of higher education to most of the country. 7.7 million former soldiers took advantage of the GI bill's higher education benefits and 2.2 million of these used their benefits for college. 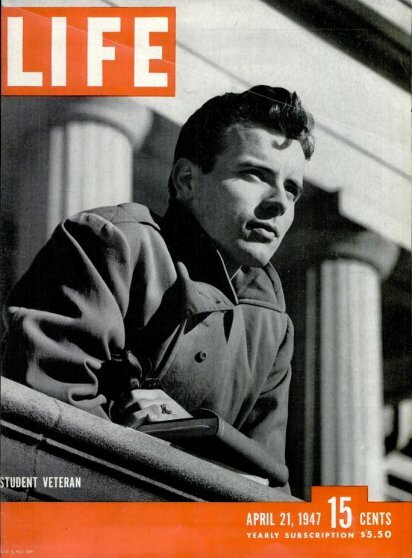 In 1947 Life magazine published a cover story in which they recognized how more than half of all university students were there due to the GI Bill. This is when public school graduates first outnumbered private education graduates. This is also when Universities adopted standardized pre-requisites to meet and new demand for their services. So in conclusion, no standardization in US secondary school programs, so the question demands we consider trends. High School Diploma's could not have become standard for College Admission in the United States prior to the High School movement where High Schools graduates became the majority of the population or roughly 1940.. Nor could they become standard for University Admission prior to public High school students being able to afford and becoming the majority in those Universities; and that occurred in 1947. Not the answer you're looking for? Browse other questions tagged united-states education or ask your own question. How did the education system in Colonial North America work? When did Harvard give its last entrance exam? How did native Hawaiians achieve such a high literacy rate prior to the 1850s? Did the University of California and University of Geneva award honorary degrees to Inazo Nitobe? When did “skipping” grades become common and when did it stop in USA? How did people apply for university in the 18th century? Why did Hawaii become a dependent state of USA after USA was born 300 years ago?